Acknowledged author Steve Chapman wrote Introduction to Materials Management (8th Edition) comprising 480 pages back in 2016. Textbook and etextbook are published under ISBN 0134156323 and 9780134156323. 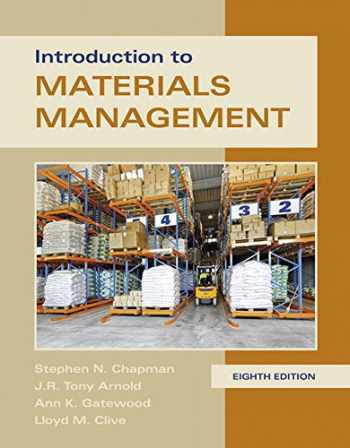 Since then Introduction to Materials Management (8th Edition) textbook received total rating of 3.5 stars and was available to sell back to BooksRun online for the top buyback price of $60.60 or rent at the marketplace. For all courses in Materials Management, Production, Inventory Control, and Logistics taught in business and industrial technology departments of community colleges, four-year colleges, and universities. Helps readers understand all elements of production planning and control, and how they fit together. Introduction to Materials Managementcovers all the essentials of modern supply chain management, manufacturing planning and control systems, purchasing, and physical distribution. Clearly written and exceptionally user-friendly, it’s content, examples, questions, and problems lead students step-by-step to mastery. Widely adopted by colleges and universities worldwide, this is the only APICS-listed reference text for the Basics of Supply Chain Management (BSCM) CPIM certification examination.